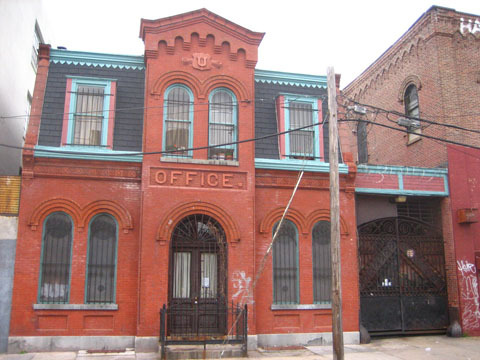 Not sure how we missed this one, but at last Tuesday's LPC hearing the Ulmer Brewery complex in Bushwick was calendared for designation. This is the first step in the designation process - next up, a public hearing at LPC. 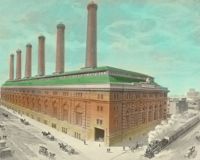 The proposed landmark includes the main brewhouse (photo below; constructed in 1872) and an addition (ca. 1880); the office (above), engine house and machine house (1886, Theobald Engelhardt, architect); and the stable and storage building (c. 1893, Frederick Wunder, architect). Despite the difference in date of construction and architects, the complex is unified by the use of the round arch style. 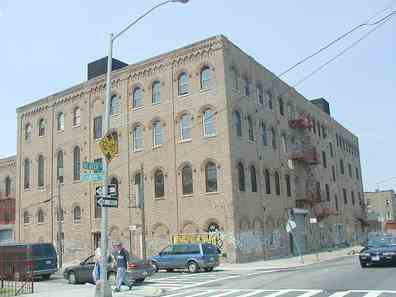 This style was popular for German-owned factories in Williamsburg and Bushwick in the late 19th century (as at Domino). William Ulmer founded the brewery in 1871 as the Vigelius & Ulmer Continental Lagerbier brewery. By 1878, Ulmer was the sole proprietor, and over the next two decades, he embarked on a series of expansions. 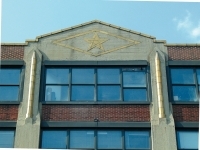 Prior to Prohibition, there were two dozen breweries in Brooklyn, 11 of them in this small 14-block area of Bushwick that became known as Brewers Row. While portions of other breweries survive today, Ulmer may be unique in that most of the historic complex is still standing. The Ulmer Brewery closed in 1920, following the enactment of Prohibition. Thanks to QueensCrap (via Bushwick BK) for catching this.